Decals are a combination of ASTRA, Trumpeter and home made. A note on the Trumpeter decals: they are very thin and wrinkle quickly , so assure that you apply them from a piece of cart. Why? to get rid of paper particles. After having them in the water, slide them on a piece of cart (removing the paper residue...) and then apply to the model as needed. - after drying, cut out; they can now be handled as any decal! 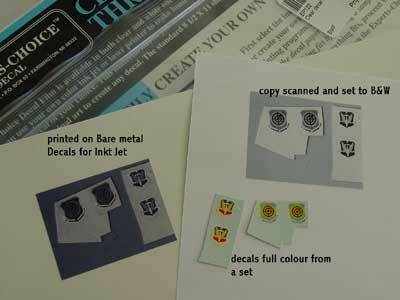 - The ASTRA decals # 3204 were used merely for the stencillings and larger RESCUE etc markings. 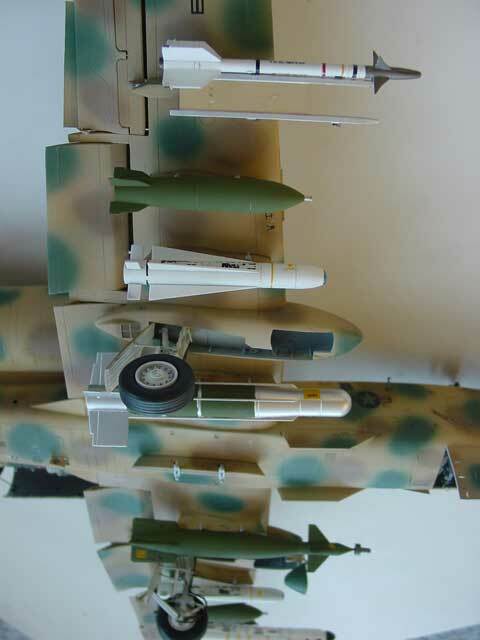 Check pictures, there are differences between individual planes. The stars-and-bars also came from the ASTRA sheet. Assure that you have a clear glossy base coat. Another trick I use is the usage of a water-delutable "child friendly" paper glue. Can be found in any bookstore. Apply the glue (with water and a brush) to the spot where you want your decals. Slide decal into position, press with a cloth and let dry. 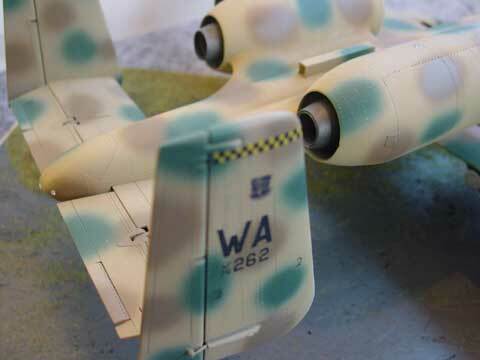 It lets your decals set well on the area with very little chance of air bubbles being trapped. 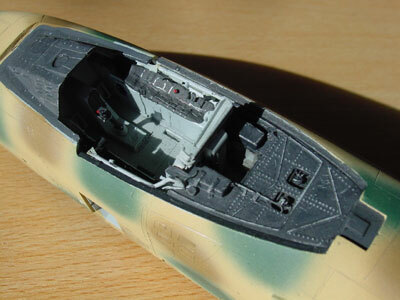 After applying the decals, clean up and apply a mat coat of Johnson Clear with a mix of Tamiya Flat base. It was sprayed on, giving an excellent sheen. 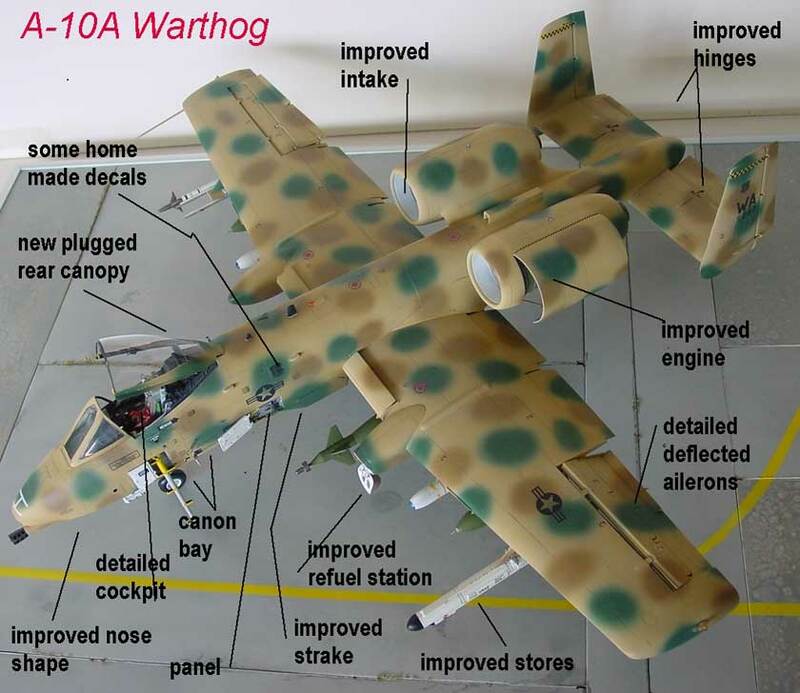 Do the same on the left off parts that have the various basic camouflage coats! 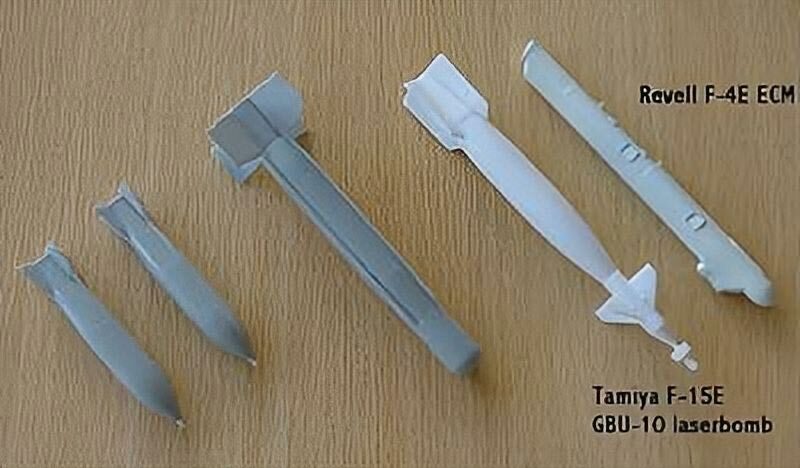 The stores in the kit vary in quality. 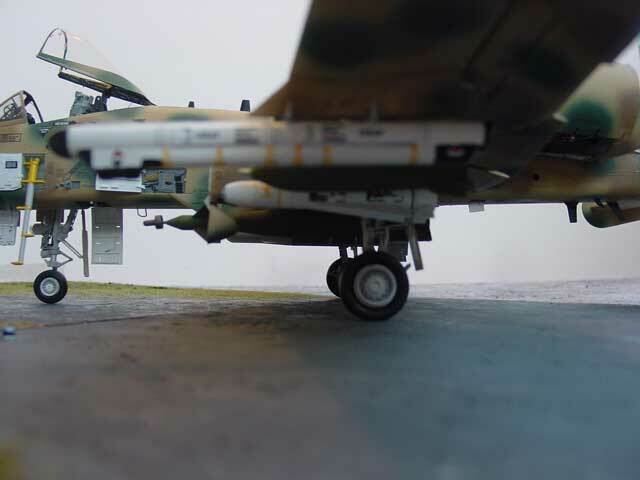 The GBU-10 was replaced with one from a Tamiya F-15E kit, the ECM pod came from a 1/32 scale Revell F-4E Phantom. 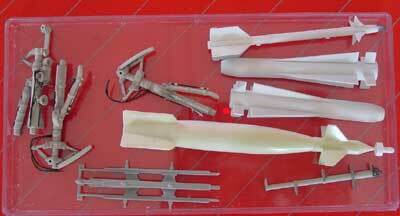 Others will be Maverick from the Revell Hunter and an AIM-9 Sidewinder from the 1/32 Tamiya F-15E kit. 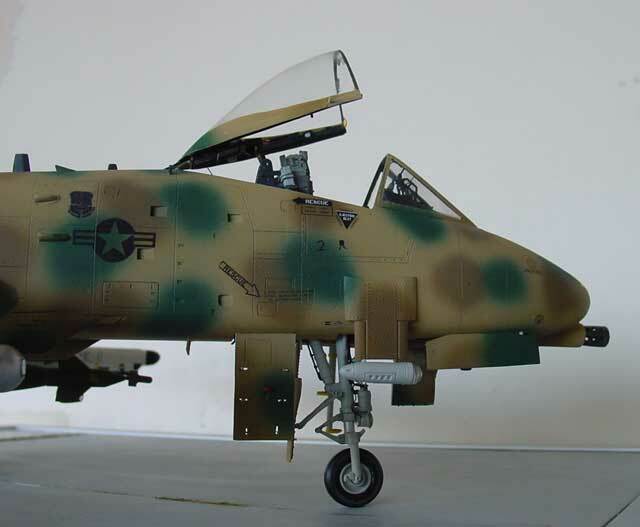 All stores were given their required colors, depicting in this case many stores for early A-10's such as the ECM pod and Sidewinder. 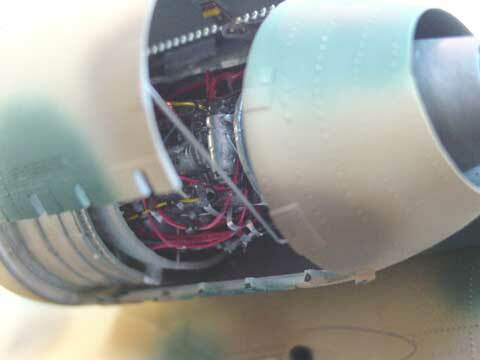 Bombs were given colors of olive and plain green with details in metal etc,. 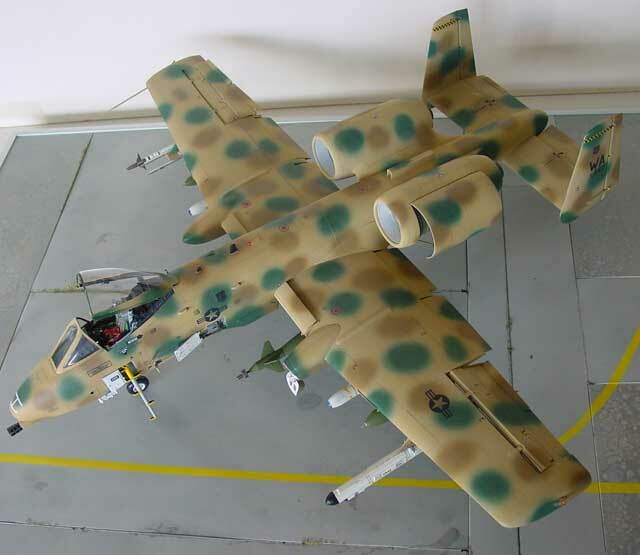 Attach desired stores and the Warthog gets its Business load! The various braces (parts H22) can be used, but need some bending with a plier to assure that they mate with the stores; obviously on the catuel plane they are adjustable for adding stability in flight. 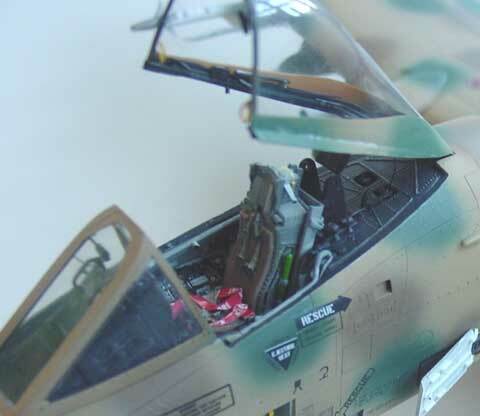 The cockpit section was further detailed with the rear panel behind the seat. 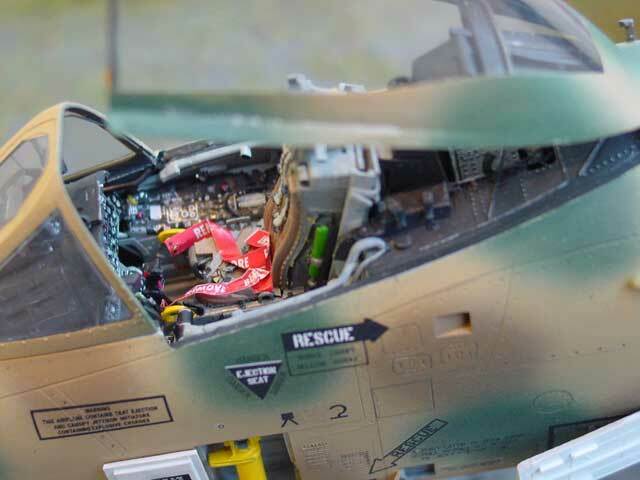 Attached transparent parts and the upper and lower anti-collision lights were give e coat of transparent Tamiya red. 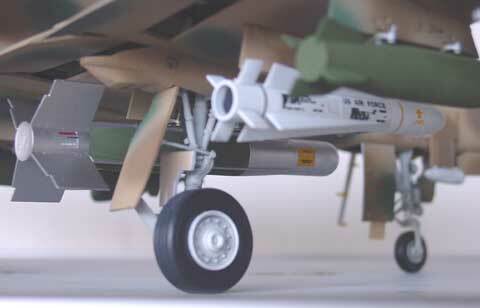 The pitot tube supplied is OK but very sharp. Finally, add the engine cover in place with the parts supplied , set the canopy, add seat. 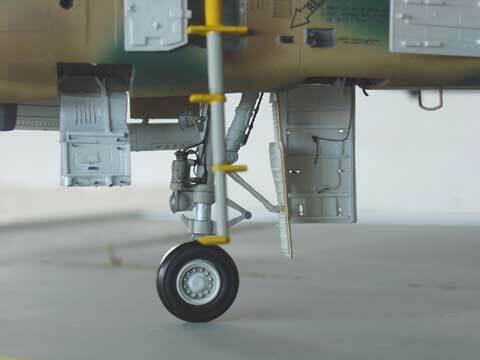 the A-10 is ready for take-off!! 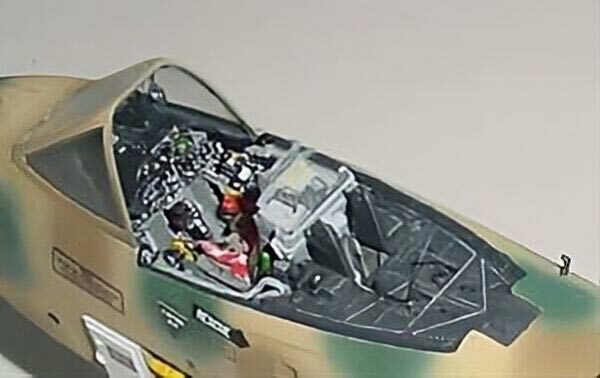 The HUD got two transparent parts, made from thin clear plastic; Trumpeter provides excellent instruments in the forward hood but electricity lines were added from very thin sprue. details with canopy left off.. The ladder from the kit is OK. 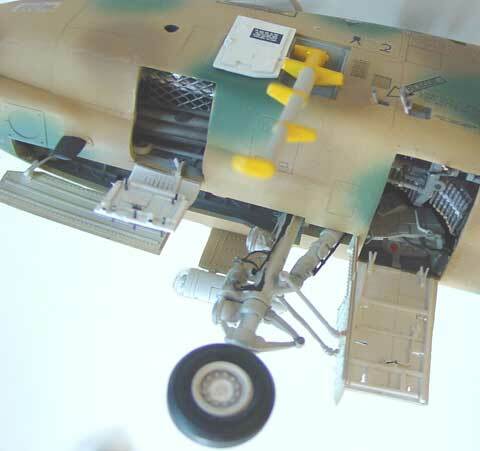 The anti-slip areas were painted with black on top of the " steps"
Forward area with opened gun access panel, note pressure locks added to the panel and their gaps; also the opened gun nozzle vents can be seen here to advantage in this picture. side view with Pave Penny Pod and corrected rear canopy and slightly tilted forward canopy hood. The shape is fatly improved here compared to the original kit parts.